Rembrandt was one of the greatest artists of the Dutch Golden Age of Painting in the 17th Century, but also in the history of Western art. Once attributed with hundreds of paintings, modern research has narrowed it down to about 300, almost 100 of which were Self-Portraits, among over a 1000 drawings as well. He was one of the most deeply personal painters to emerge in the Baroque era; not just due to his many Self-Portraits, but in his emotive style unhinged from convention, yet masterful in skill. His masterworks, such as The Night Watch, or even his earlier piece, Anatomy Lesson of Dr. Nicolaes Tulp, are amongst the landmarks of great painting in the Dutch Golden Age. 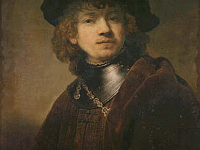 Born in the city of Leiden in the Netherlands, Rembrandt studied early on in Amsterdam with the painter, Pieter Lastman (1583 – 1633), then opening a workshop in Leiden with a fellow pupil, Jan Lievens (1607 – 1674). By 1627 Rembrandt was already taking students, among them the 15 year old Gerard Dou (1613 – 1675), who would also become an influential painter. Having secured commissions with the court of The Hague, his paintings from this period in Leiden were rather small, but rich in details, showing the influence of Lastman. His themes were mostly religious and allegorical, but during his early years in Amsterdam, between 1632 and 1636, Rembrandt began to paint dramatic biblical and mythological scenes in high contrast and of large format, such as, The Abduction of Europa, from 1632. He also began accepting portrait commissions. In Amsterdam he married Saskia van Uylenburg (1612 – 1642), the cousin of Hendrick van Uylenburgh (1587 – 1661), an art dealer who was at the time hosting Rembrandt and also influential in furthering the artist’s career. Saskia modeled for some of Rembrandt’s works and it is in the studio that Hendrick provided that he painted his famous, Anatomy Lesson of Dr. Nicolaes, among other works. During the late 1630s, Rembrandt began executing etchings of landscapes and fewer paintings, which become moody reflections of his personal tragedy when Saskia fell ill. Rembrandt continued to paint moving portraits of her while on her death bed before she passed in 1642. The greatest exception in this sober period was his masterwork, The Night Watch, a title that is a misnomer for the spirited day scene, but the work had suffered some dulling on the surface giving it the appearance of a night scene. In the 1650s, Rembrandt's style changed and his paintings increased in size, with richer colours, and more pronounced brush strokes. With these changes, Rembrandt distanced himself from earlier work and current fashion, which increasingly inclined toward fine, detailed works. Over the years, he still depicted biblical themes often, but his emphasis shifted from dramatic group scenes to intimate portrait-like figures. 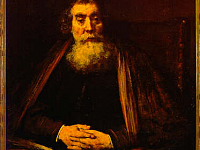 In his last years, Rembrandt painted his most deeply reflective self-portraits, and several moving images of both men and women in love, in life, and before God. 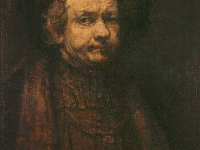 His Self-Portrait as an Old Man and Portrait of an Old Man, now in the Uffizi Gallery are good examples of these later works and can be contrasted to another work in the Uffizi, his Self-Portrait as a Young Man.